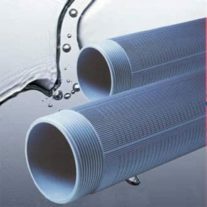 PVC ribbed pipes and screens are made with non-toxic materials and comply with the hygienic requirements of Ministerial Decree n° 174 dated 06/04/2004. Longitudinal grooves prevent sand and gravel from settling near the openings. 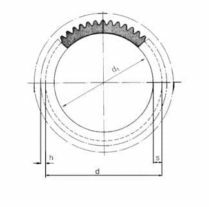 This allows the rising of water inflow speed, improving the hydraulic features and increasing the flow rate. 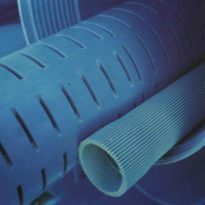 Data demonstrate that ribbed screen doubles its permeability compared to a smooth screen of the same dimensions, therefore it is possible to reduce drilling diameter with consequent money saving. 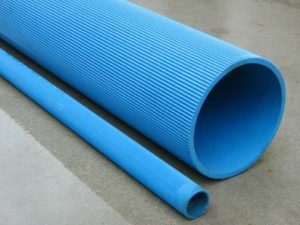 Moreover, the grooves contribute to the stability of the entire column and provide higher resistance to external pressure borne by axial load of carrying tubular section. In horizontal drainages it helps water collecting. * Male-male threaded connections with coupling.